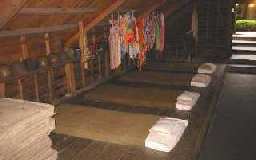 The triangular barracks were the quarters for kamikaze pilots  at the end of the Pacific War. They were scattered in pine groves around the airfield. The wooden barracks, built half underground where only the triangular roofs could be seen, were camouflaged with large trees put on top of the roofs. This is the site where one of the triangular barracks was located. As we remember the feelings of those pilots and console their spirits, this is a monument where we pray for the eternal repose of their souls. The two lanterns in front of the main monument were added in the summer of 1985 through the efforts of Jirō Kōsaka, who served in Chiran in 1945 and has written three books about kamikaze pilots in Chiran and other Army air bases. The lanterns have the inscription: "These tears stored in vain with no time to flow." 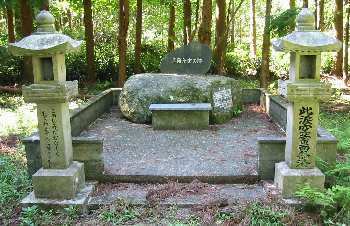 The right lantern has only kanji (Chinese characters) for this inscription, and the left lantern has the same inscription written out in hiragana (cursive Japanese phonetic characters). 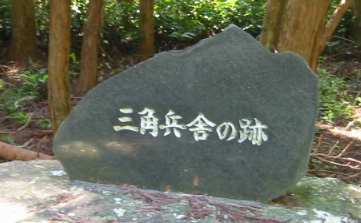 The monument is located about 45 minutes by foot from the Chiran Peace Museum for Kamikaze Pilots. There is a full-size replica of a triangular barrack next to the museum building (see two photos below). 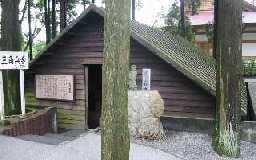 The triangular barracks were the quarters of kamikaze pilots. In order to deceive the enemy, they built bunkers half underground in the middle of pine groves and camouflaged them by covering the roofs with young cedar trees. The pilots who gathered together from various places died a glorious death far away in the clouds of the Okinawan skies after spending two or three days here. On the night before their sorties, they held farewell parties in these barracks, where they sang military songs and wrote their farewell letters in dim light under a bare light bulb as they drank sake. Then they sortied. A triangular barrack has been reconstructed here as a reminder of those days. Visitors can reach the remote monument at the site of one of the triangular barracks by taking a path from the road and climbing up a small hill. Chiran Town put up the following sign at the entrance by the road. The beginning includes two short poems. Our country in ruins, only mountains and rivers. Summer grasses, remains of soldiers' dreams. The top of this hill has the remains of the triangular barracks. Pilots who had received orders for a kamikaze sortie slept here for the last time in their lives. A pilot's dream the night before his sortie: sinking an enemy carrier or a dream of mother, caring mom. Perhaps he called "mom" as he asked forgiveness for being an undutiful son. Those pilots were still young. In their limited world, they kept in their hearts only the faces of their mothers. The pilots only know her. 1. The Japanese phrase translated as "kamikaze pilots" is "tokkōtaiin" (or shortened to "tokkōtai"), which literally means "special attack corps members" in English. The word "kamikaze" has been used in other places where the original Japanese is "tokkō" or "tokkōtai." The Japanese Army did not use the term "kamikaze" during World War II, but now even the museum at the former Army air base at Chiran uses this term to describe the Army's pilots and crewmen who carried out suicide attacks.